When traveling, the number one thing that you will restrict yourself to is the internet. Even if you happen to have a connection in your hotel room or if you find a hotspot nearby, it may not be safe. You will surely encounter a public network, but the security protocols won’t be enough to protect you and your privacy. In order to prevent that, you can get the best portable WIFI router and make your own private network. These devices are compact and portable, some even tend to be pocket-friendly. With the right model, you can finally surf the web without worrying. In the next section, we will discuss one of the best portable routers available. The WOSUK Wireless N Mini Wifi Router Repeater is really amazing when you consider all the features that it offers. It can support high download speeds up to 300Mbps, which is really your highest priority. Having a stable connection but a slow one will always be a pain, but this model prevents that. It also has a dual band antenna which will broaden up and spread the signal around your home. One of the special features about this device is that it offers up to four different modes. It can work as a router, AP device, repeater and even as an access point. 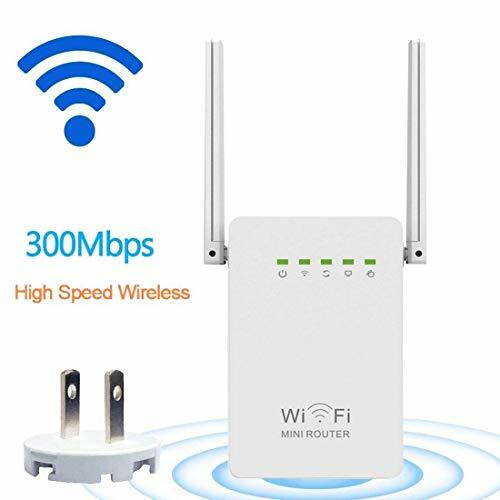 This model will spread its WIFI range in your entire house and remove any dead areas where the WIFI can’t usually reach. It is even compatible with most smart devices. Supports high internet speeds, up to 300Mbps download speeds. This is certainly one of the best portable WIFI router models out there. Its strongest points are that it offers modern security protocols and that it can reach high download speeds. Although it isn’t the smallest portable router out there, it is still small enough to fit the category. We really liked that it had two antennas which can be pointed around. This can be quite helpful if you require a more stable connection at a certain part of your house. It didn’t remain solely as a WIFI router, it also offered other functions which added versatility. There are four modes in total, it can act as a router, AP, repeater or as a hot spot. This way you’re buying a multifunctional device that will fill multiple purposes. The WIFI signal is also very stable and can reach most areas which are regarded as dead zones. It even has a WPS encryption technology which can be used if you prefer it. The only negative aspects of it were that this model is hard to set up. It certainly is harder to set up compared to most popular WIFI portable routers. It does come with an instruction manual, but it isn’t coherent enough due to a bad English translation. Although the WOSUK portable WIFI router is a great device, you shouldn’t just restrict yourself to it. There are other portable routers which are as equally good as this one, some are even better. For an example, the TP-Link N300 is a great alternative if there are some other features that you’d prefer more. It is far smaller than the WOSUK, the TP-Link model can even fit in your pocket. There are even additional options which offer you to buy it with additional ethernet or USB ports. This device can create a WIFI hotspot with ease as it isn’t difficult to use and set up. If you tend to travel a lot, then you can choose the WOSUK Wireless N Mini Wifi Router Repeater as your companion. You will get a compact device that can sometimes even fit your pockets. But its main point is that you will secure yourself a stable and private network. Privacy is getting more important and in order to secure it, you will need the latest internet security protocols. You can achieve both privacy and a stable connection with the help of the Wosuk. It isn’t the smallest WIFI router out there, but it certainly does a better job at providing higher speeds than others. The Wosuk can be even used at your own home, where you can set it up as a WIFI extender in order to get a stable signal everywhere in your house.